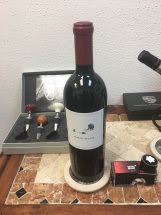 4 CASES LEFT NOW....ONLY $52.95/ BTL FOR A TOP NAPA CAB from a TOP SUPERSTAR WINEMAKER! Unquestionably a rising superstar in California, Frenchman Benoit Touquette makes a bevy of wines from throughout Napa Valley, all of which show impeccable winemaking and balanced-hence the funny label-see PIC attached- layered profiles. 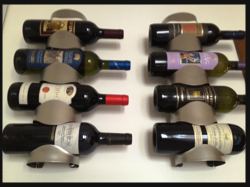 HINT, HINT: IF YOU LIKE FAUST CAB and QUINTESSA CAB MERITAGE, you WILL LOVE TEETER-TOTTER CAB! Born in Lyon France and gaining his education from the University of Bordeaux, Benoit worked at numerous French wineries before getting a job (with the help of his friend and mentor Michel Rolland) in Napa Valley with Andy Erickson. He consulted for the likes of Screaming Eagle, Ovid and Arietta. Today, Benoit is the winemaker for Realm Cellars, Hartwell, and Kata, as well as numerous other labels, including his own project Fait-Main (which translates to "hand-made"). This report looks at his latest releases from Fait-Main, Teeter-Totter, Familiar Air, Jack Quinn, Hartwell and Kata. 2015 TEETER-TOTTER NAPA CAB $52.95/BTL. The 2015 vintage is powerful and well-balanced boasting with fresh aromatics. Pops of blackberry, raspberry, and vanilla grab you first followed by subtler notes of thyme, violet and lavender. 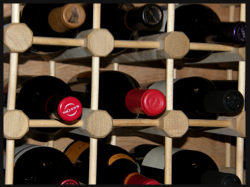 The smaller percentages of Bordeaux varietals create a juicy palate filled with impeccably balanced tannins. The well-structures fruit laden finish keep you coming back for more. Something of a smorgasbord blend of 75% Cabernet Sauvignon with dollops of Merlot, Syrah, Zinfandel, Petite Sirah, Petit Verdot, Malbec and Cabernet Franc, the 2015 Cabernet Sauvignon offers up loads of incense, spice box and dried flowers notions over a crème de cassis, cherry pie and fruitcake core. The medium to full-bodied palate is plush, rich and bursting with spicy black and red fruit flavors, going pleasantly savory on the finish. I grew up in Lyon thinking I would become a fighter pilot or an engineer. I never considered wine until I was in Bordeaux working mobile bottling lines to pay for graduate school. The infectious passion of the winemakers I met, showing up day after day with the same fire in their eyes, blew me away. I switched my focus to oenology and completed two degrees, then left France to intern with Andy Erickson and explore uncharted possibilities in Napa Valley. I worked hard, learned from everyone, and pushed myself to deliver the kind of winemaking I believe in. I've never missed a picking day, and I'll spend as much time as it takes to get the wines right. I started Fait-Main because I fell in love with a vineyard… and then another, and another. Shauna saves me from myself.